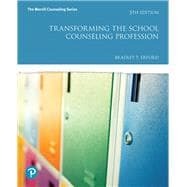 Transforming the School Counseling Profession demonstrates how to effectively implement systemic, data-driven school counseling programs.This clearly written text presents the profession in easy-to-understand language, and is illustrated with numerous applied examples, case studies, and vignettes. The 5th Edition has been updated to include all of the latest CACREP, ASCA, and ACA standards. It also now includes the DSM-5. Coverage of cultural competence has been expanded throughout the book. MyLab is the teaching and learning platform that empowers you to reach every student. By combining trusted author content with digital tools and a flexible platform, MyLab personalizes the learning experience and improves results for each student. MyLab Counseling organizes all assignments around essential learning outcomes and the CACREP standards–enabling easy course alignment and reporting. Note: You are purchasing a standalone product; MyLab Counseling does not come packaged with this content. Students, if interested in purchasing this title with MyLab Counseling, ask your instructor to confirm the correct package ISBN and Course ID. Instructors, contact your Pearson representative for more information. Bradley T. Erford, Ph.D., is the 2012-2013 President of the American Counseling Association (ACA) and a professor in the school counseling program of the Department of Human and Organizational Development in the Peabody College of Education at Vanderbilt University. He has authored or edited more than 30 books. His research specialization falls primarily in development and technical analysis of psycho-educational tests and outcomes research and has resulted in the publication of more than 70 refereed journal articles, more than 100 book chapters, and 15 published tests. He has received numerous awards for his scholarship and service to the counseling profession from ACA and the Association for Assessment and Research in Counseling (AARC), organizations within which he has held numerous leadership positions.